In 2006, MaKendra Umstead's mother was diagnosed with breast cancer. Her mother's journey through the treatment process had a profound effect on Umstead's academic trajectory. Inquisitive by nature, Umstead was inspired to research cancer after her mother's experience — from the initial diagnosis to approaching 10-years cancer-free — generated more questions than answers. 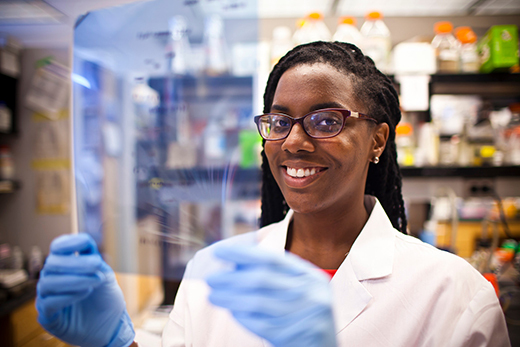 Today, Umstead is a fifth year graduate student in Cancer Biology, a sub-program of the Laney Graduate School's Graduate Division of Biological and Biomedical Sciences. Her research is focused on processes that might lead to better cancer treatments. We caught up with Umstead to learn more about her background, her research and her plans for life beyond Emory. Tell us a bit about your background and what led you to pursue the PhD. My first exposure to research was in high school when I spent a few weeks during the summer in a food science lab at North Carolina State University. I found each day to be exciting as I worked with research scientists and received hands-on training while conducting a small project focused on improving nutritional content in food products. Soon after, I attended North Carolina Central University, a historically black university located in Durham, North Carolina, where I majored in pharmaceutical sciences and minored in chemistry. I also engaged in off-campus research experiences at Yale University School of Medicine and at Merck Research Laboratories in the fields of neuroscience and cancer drug development, respectively. As I neared my later years in college — energized by a nurturing academic environment, fruitful research experiences and a desire to learn more about human biology — I set my sights on earning an advanced degree in the field that motivated me: cancer. How did your search lead you to Emory? I learned about the Cancer Biology program at the 2010 Annual Biomedical Research Conference for Minority Students graduate school fair in Charlotte, North Carolina. Representatives from the Laney Graduate School's Graduate Division of Biological and Biomedical Sciences were manning the table, offering information and answering questions about Emory. The program was just starting and was recruiting its first class of students. I chose Emory for a variety of reasons. It was not an easy decision, but when I weighed all options, Emory best suited my interests. First, Emory had the most intriguing research opportunities. There were several individuals who I thought, from their research descriptions and actually meeting them during recruitment, would be great potential research mentors. Second was the program curriculum. I wanted to focus on Cancer Biology and Emory's program was rare. Although it was new, the academic focus on cancer, opportunities to learn about the translation/clinical aspects of cancer research and the proximity to the hospitals of Emory Healthcare were definitely a sell. Third was location. I knew Atlanta would be a wonderful city where I could also experience rich personal and cultural development. What is the focus of your research and how did you arrive at this topic? The reason I decided to come to graduate school and to pursue a career in cancer research was to improve the lives of cancer patients in the future by developing new therapies for the disease. While this may seem like a lofty and long-term goal, it sticks with me each day. I joined the laboratory of pharmacology professor Haian Fu to conduct my dissertation research. Overall, my work focuses on discovering how genetic alterations found in glioblastoma multiforme, the most aggressive and deadly form of brain cancer, are involved in driving tumor growth. When the genetic makeup of cancer cells is altered, so are the protein-protein interactions that drive cellular processes such as growth and proliferation. Unlike breast cancer, therapeutic options for glioblastoma remain very limited; therefore, understanding how the disease develops and identifying new opportunities for cancer therapy is essential. What do you hope to do after your time at Emory?